"11 puppeteers working under our feet giving life to a dinosaur. Great work! #JW2"
"I think the lack of animatronics in Jurassic World had more to do with the physicality of the Indominus, the way the animal moved. It was very fast and fluid, it ran a lot, and needed to move its arms and legs and neck and tail all at once. It wasn't a lumbering creature. 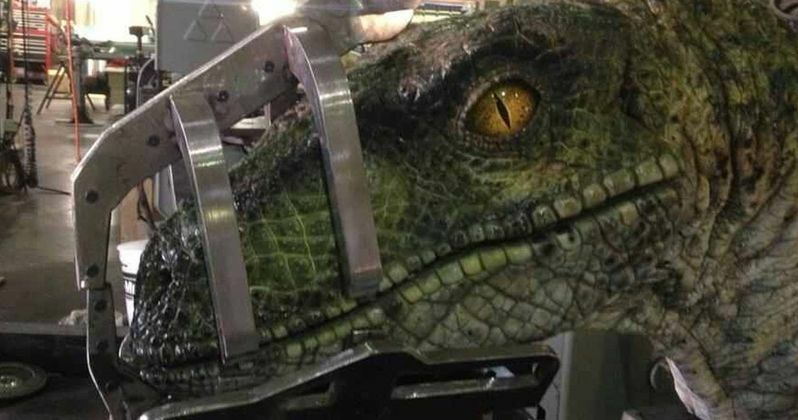 We've written some opportunities for animatronics into [Jurassic World 2] - because it has to start at the script level-and I can definitely tell you that Bayona has the same priorities, he is all about going practical whenever possible. There will be animatronics for sure. We'll follow the same general rule as all of the films in the franchise which is the animatronic dinosaurs are best used when standing still or moving at the hips or the neck. They can't run or perform complex physical actions, and anything beyond that you go to animation. The same rules applied in Jurassic Park." The idea that there will be more practical effects in Jurassic World 2 should make fans happy. Outside of that, we still don't have much in the way of official word in terms of plot details, but we have learned some bits and pieces recently. The movie will probably be dealing with the dilemma of what to do with the dinosaurs now that the park is shut down and what rights they will have. This was alluded to via a couple of domain names that the studio recently purchased; IslaNublarRescueMission.com and AllCreaturesHaveRights.com. It also seems that there will be some kind of rescue mission taking place. Some rumors suggest that it will be to save the dinosaurs from government officials who want to weaponize the dinosaurs, or kill them off entirely. Another rumor points to the possibility of a volcanic eruption threatening to wipe them out. The Jurassic World cast includes Chris Pratt, Bryce Dallas Howard, B.D. Wong, Toby Jones, Rafe Spall, Daniella Pineda, James Cromwell, Geraldine Chaplin and Ted Levine. Jurassic World 2 is written by Jurassic World director Colin Trevorrow and Derek Connolly. The movie is being directed by J.A. Bayona and is set for release on June 22, 2018. Be sure to check out the set photo for yourself below.